Winter melon (Benincasa hispida, 冬瓜, dong gua) is also known as white gourd and winter gourd. The melon is shaped like a long squash and can grow as large as 80 centimeters (30 inches) in length. It has a chalky dark green (some time pistachio green) colored skin with a waxy feel. It has a thick white flesh that is water-rich and has a texture similar to that of the white part of a watermelon. Mature winter melon is commonly used in Chinese cooking. 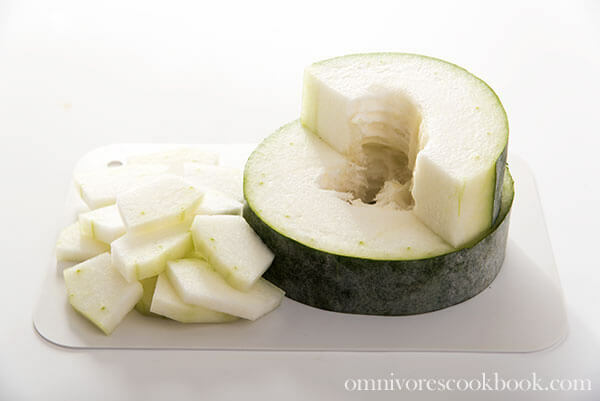 The white flesh of the winter melon has a mild, refreshing, and grassy flavor, reminiscent of cucumber. It’s rarely consumed raw. The white flesh becomes soft and transparent once cooked. Winter melon can be cooked in stews, soups, and stir fried and braised dishes. 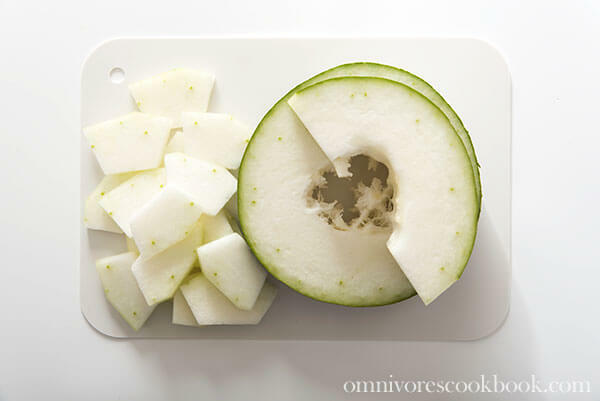 Because winter melon itself tastes very plain and its texture absorbs flavor very well, it is often cooked with pork, chicken and other strongly flavored ingredients to imbue in the melon a richer flavor. One of the most famous Chinese dishes is winter melon soup that is cooked with chicken or pork broth. The winter melon needs to be skinned, seeded, and chopped before cooking. Unwashed whole winter melon can be stored in a cool, dark, dry place for up to 5 months. Once sliced, you should always wrap it with plastic wrap and store it in the fridge, where it will last up to 1 week. You can find winter melon at Chinese supermarkets. Due to its huge size, you’re more likely to find a portion of a melon than a whole melon.